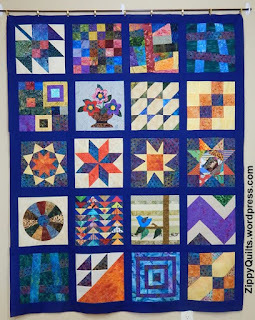 52 Quilts in 52 Weeks: April 1 UFO Parade -- No Foolin' this time! 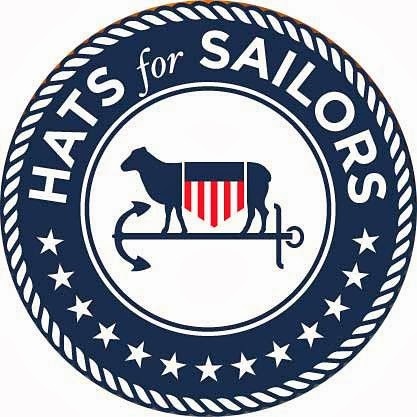 April 1 UFO Parade -- No Foolin' this time! Sorry the UFO Parade is late this month. I'm tellin' ya, this having a job is interfering with my blogging! But I love it. Can you believe I get paid to play with fabric all day? 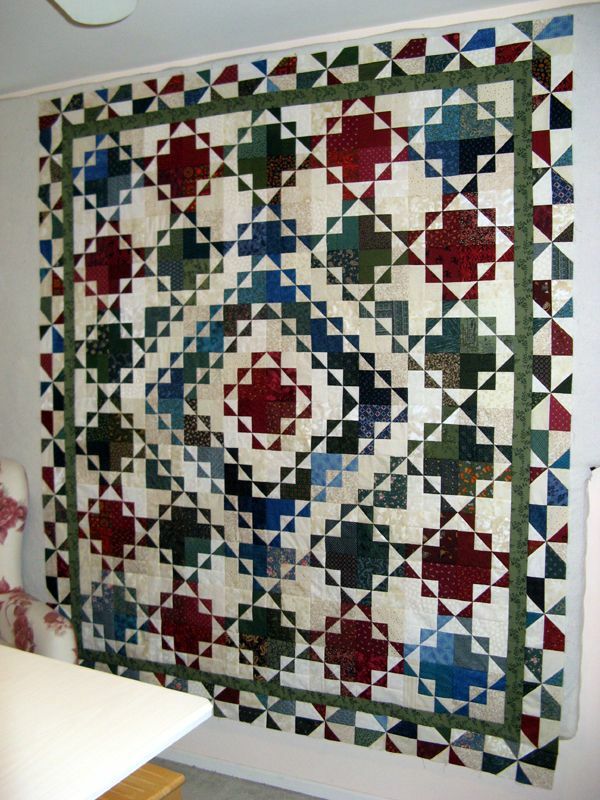 I had a lot (I still do) of CW (Civil War reproduction) fabrics that were approaching 2-decades old. 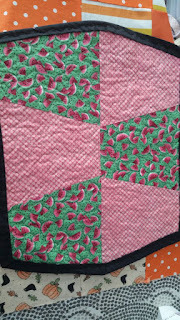 I played with the Pineapple Trim Tool, using those 'scrap fabrics' and fell in love with the 1st block. 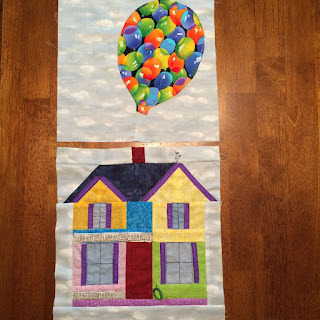 So, I just kept going, using the same fabric theme. I'm so happy with the results! The top is now being custom-quilted and I should have it back by end of April! Yippee!! 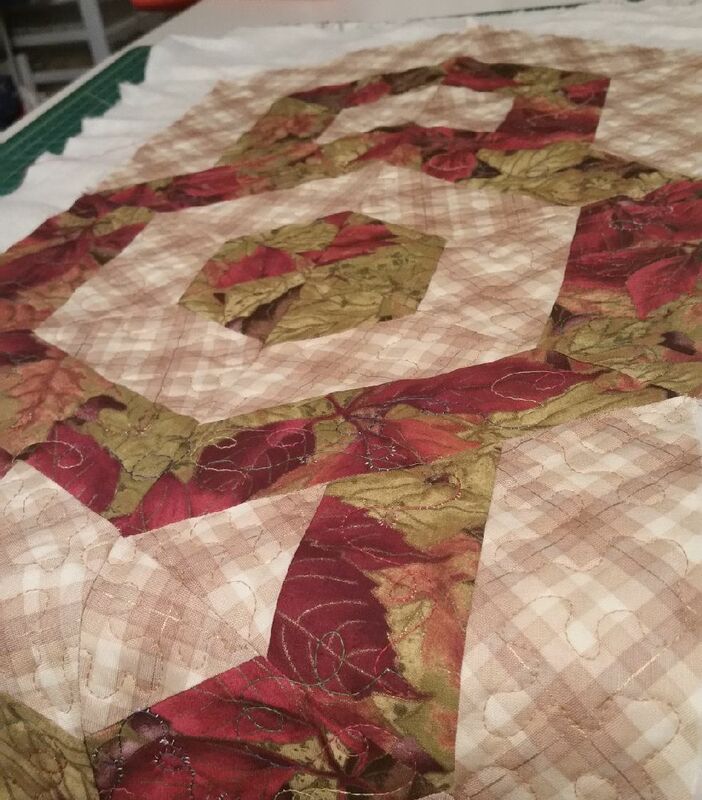 Ethel, I can't wait to see how this one looks after it is quilted! Jennifer has had a hard month, and I hope you all will send good karma her way. But she still managed to get a lot of things finished! 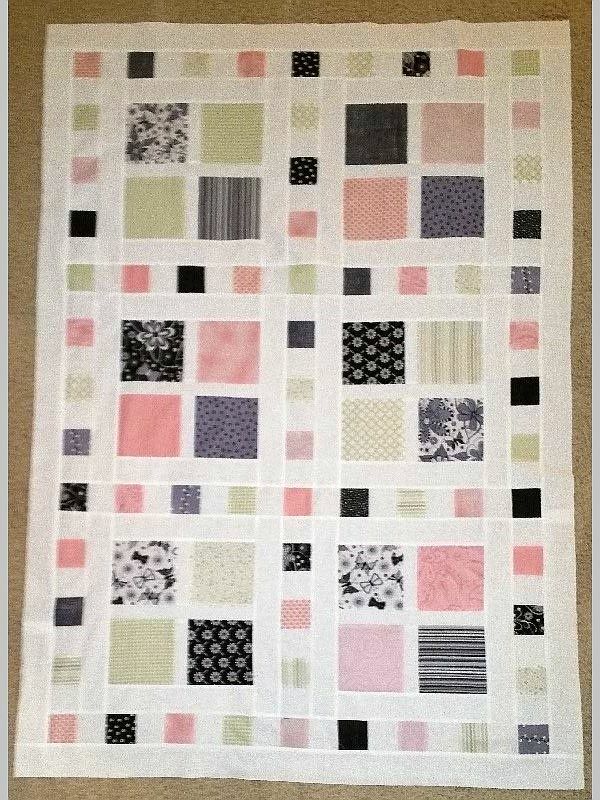 Her second finish is this darling baby quilt. 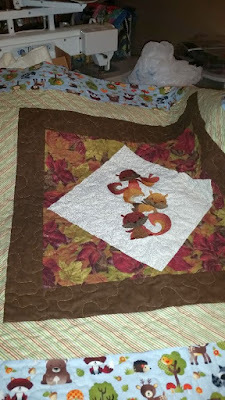 She even quilted sentences in the borders! This side reads, "A dream is a wish your heart makes." And this side reads, "Go to bed, get some sleep!" 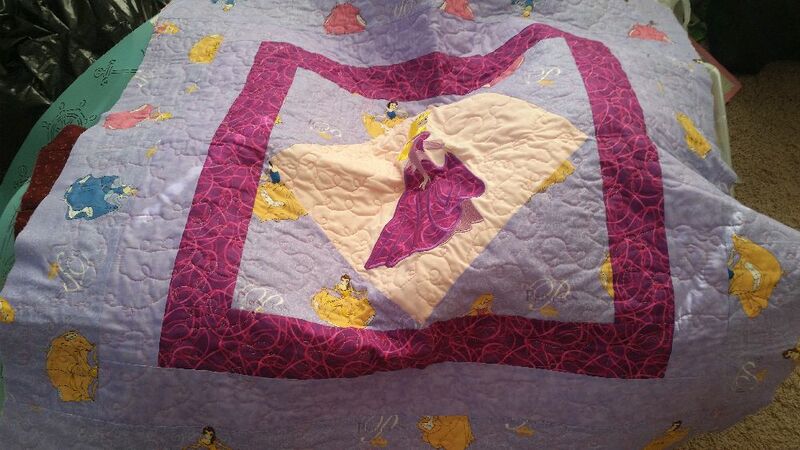 Look at this adorable "princess" quilt Jennifer made! Here's my bag #2, hot off the machine. 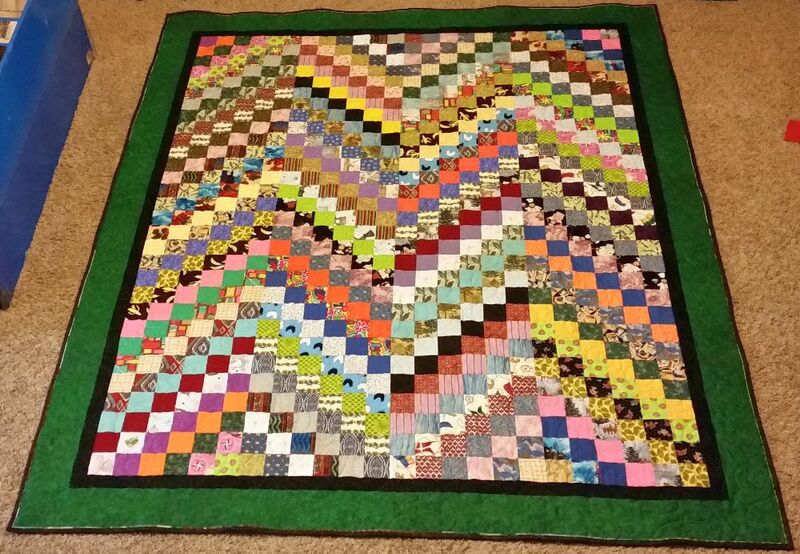 I'll be binding it tomorrow. I'm not sure what to call it just yet, but probably something with Nana in it. My grandmother passed away on Dec 6, 2015, at the age of 92. it was a running gag to get her things with squirrels and chipmunks since she was absolutely petrified of squirrels or chipmunks taking over her house. So I'm up for any name suggestions! Jenn, I have the candle burning for you and your Mom. I'm so impressed with all you've finished this year! Donna also had a productive month. First is her block (well, two) for a raffle for her local guild. Donna tells me the blocks are designed after the house in the Disney movie "Up." Donna, I never saw that movie, but now I will be checking Netflix for it! The second one is a quilt I started several years ago for my granddaughter, Kathryn. I wanted the name of the blocks, as well as the whole quilt, to have a meaning/story to them. I found a block pattern named "Grandmother's Dream" that I sorta liked, changed it up a little and called it "Nana's Dream" because that is what my grandkids call me. 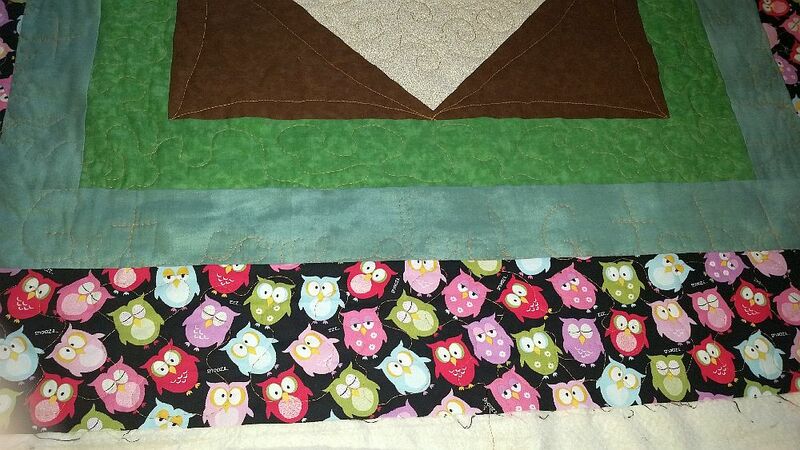 I didn't realize how difficult it would be to piece the blocks and wound up setting it aside for a bit. I picked it up again in late 2014. 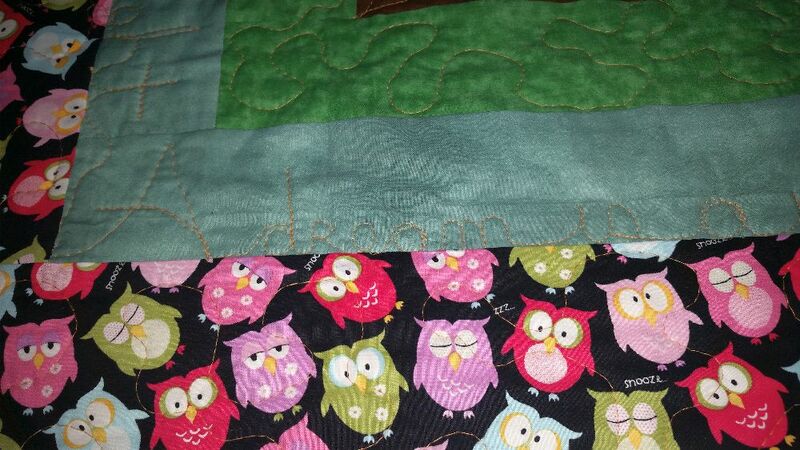 The blocks have words embroidered that are the dreams I have for her as she grows up. The dream bubbles in the center are her current dreams, or things she likes to do. I decided to use a quilt as you go method and was working on the embroidery one evening at my daughter's house. Kathryn started watching me (she was then almost 7 years old) and wanted to learn. 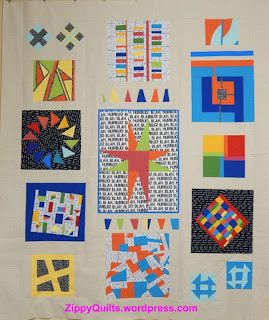 She chose which picture to put in each block (and had a logical explanation for her choices) and embroidered some of them. 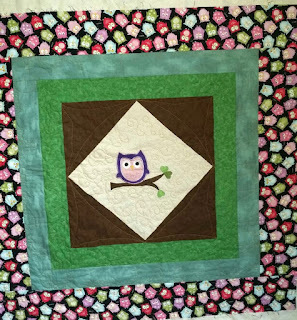 Her first embroidery project was the doll on the "laughter" block of this quilt. 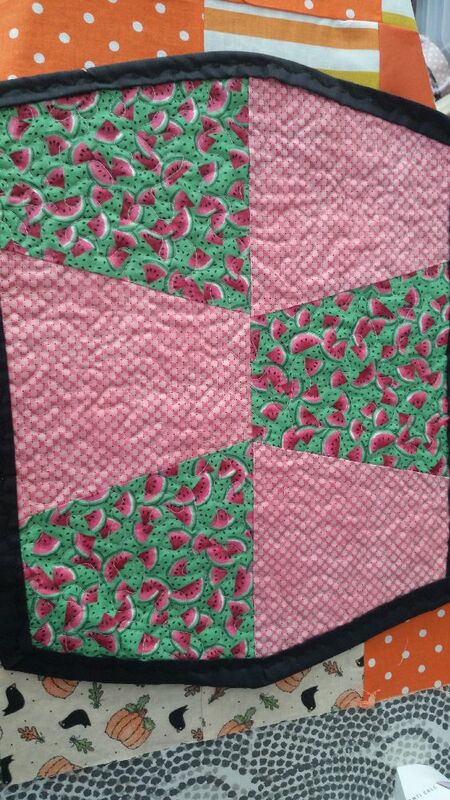 The blocks were partly machine quilted and partly hand quilted then joined together with a fabric that Kathryn picked out. 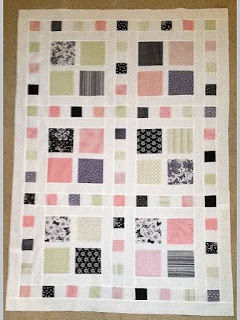 She also decided the layout of the blocks and the dream bubbles. 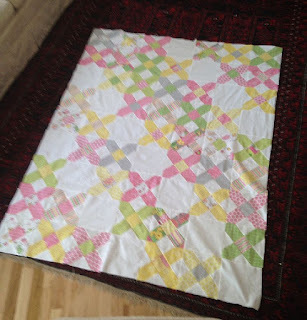 And yes, that is Susie's Magic Binding. Donna, that is the sweetest story. And I'm delighted you used Susie's Magic Binding! Sue's "finish that isn't quite" made me laugh. 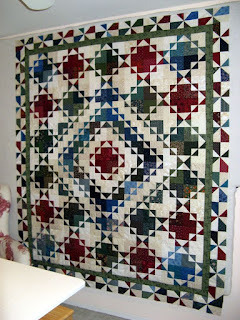 And it also makes me want to make this quilt! 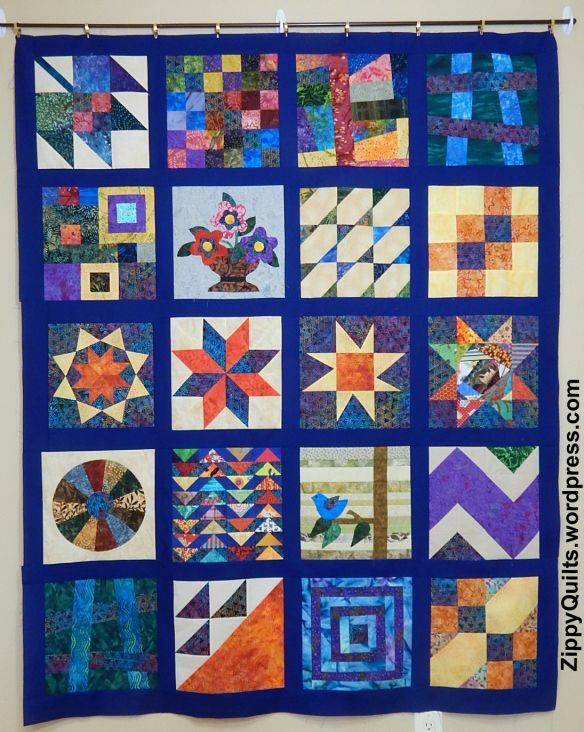 Check out the rest of the story at Sue's Quilty Bits and Bobs. Friend Martha in Idaho is looking forward to another new grandbaby in September. 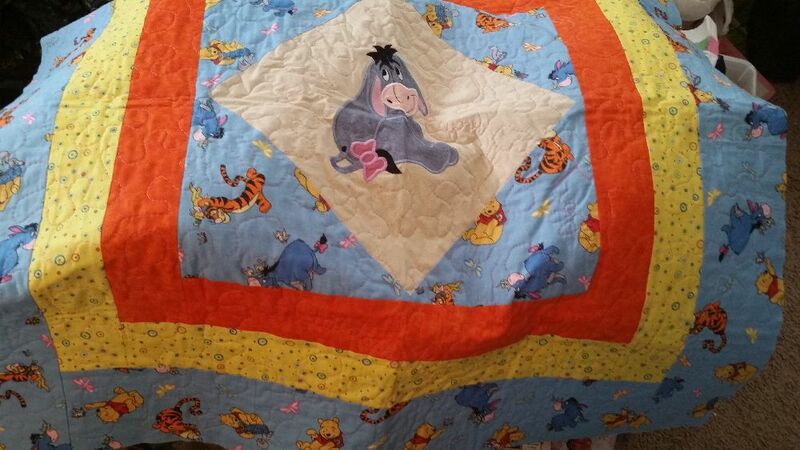 She says since she doesn't know whether it will be a boy or a girl, she made a quilt for each! I can't decide which I like better, Martha! Kerry is another two-time finisher. 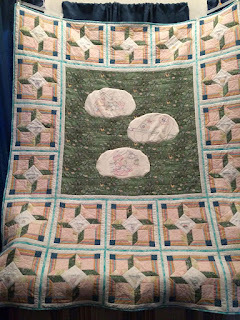 She welcomed a new granddaughter in February, and made "Square Dance" from Gigi's Thimble for her. 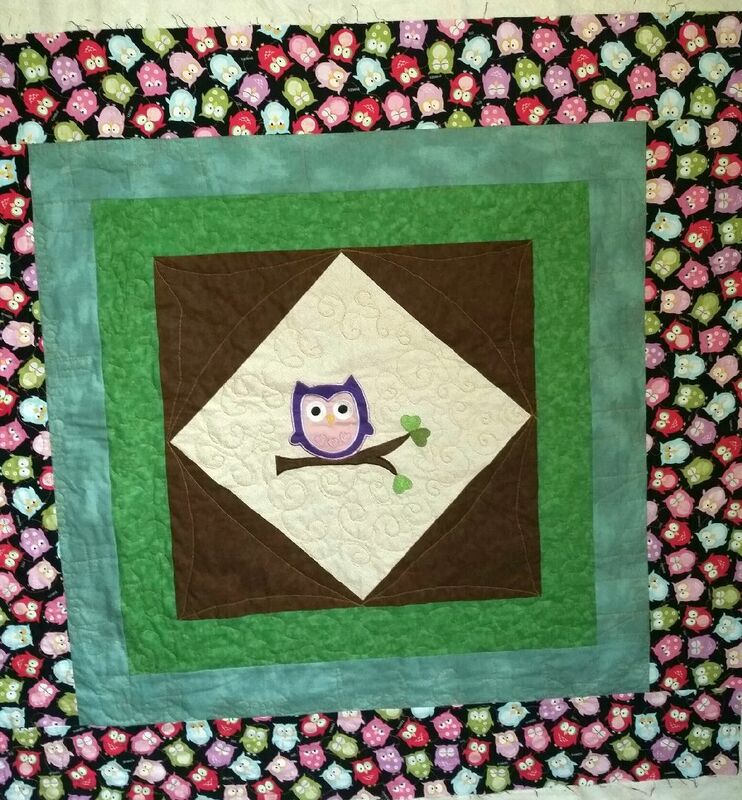 The second one is a mini called Tidbit from Miss Rosie’s Quilt Co. This was the pattern and charm squares that Kerry won in last year's UFO parade! Kerry, thanks for sharing your prize. I wondered if people enjoyed the UFO prizes, or if they just added to the UFO stashes! 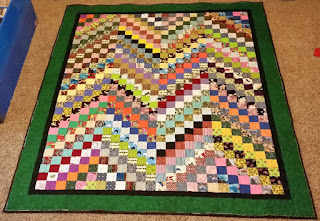 Clever Becky finished her "Scrappy Bargello" quilt -- and look what she did for the backing! 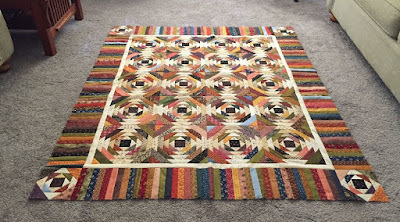 "Scrappy Bargello" was going to be my March UFO, but I didn't get it back from the longarmer in time. 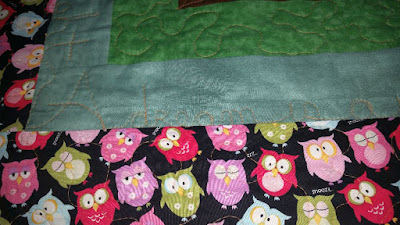 I finally got the binding on last Saturday (Susie's magic binding, of course) so it can at least make it in the April parade! :) When I got the top done the fabric I had in mind for the backing just didn't seem like a good match anymore, but I was determined to only use what I had on hand. 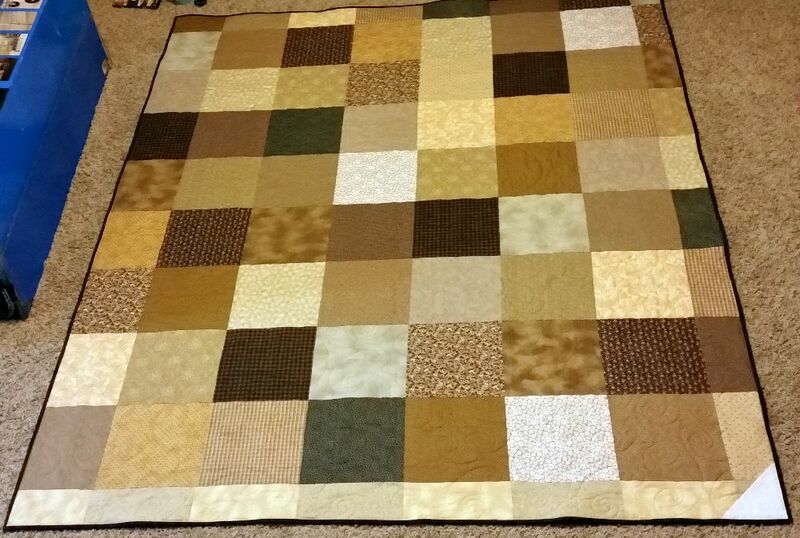 A good mix of browns I wanted to clear out of my stash was the perfect answer. And yet another two-finisher, Mary J send photos of these lovelies. 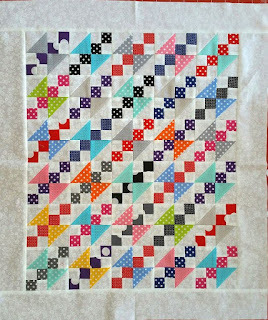 First is her modern sampler. 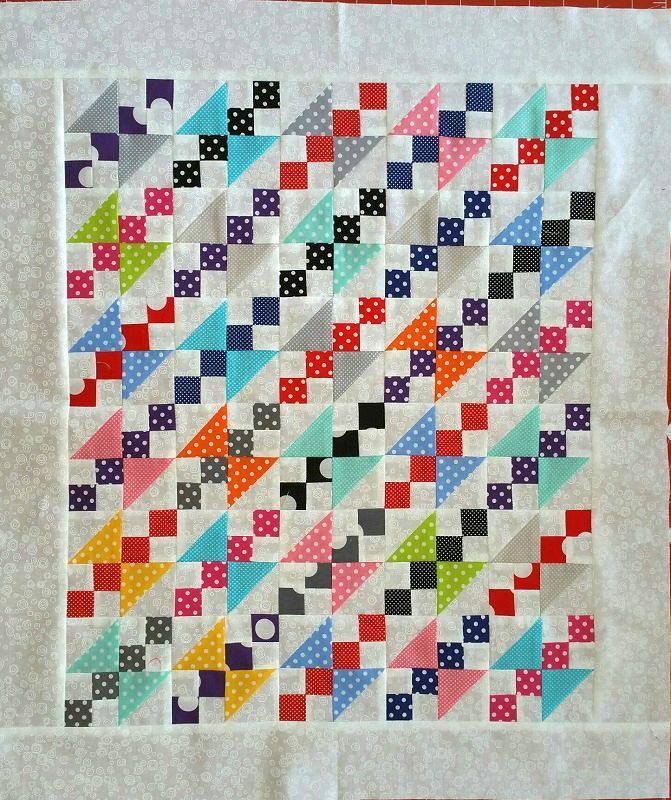 Clever layout for disparate blocks, MJ! 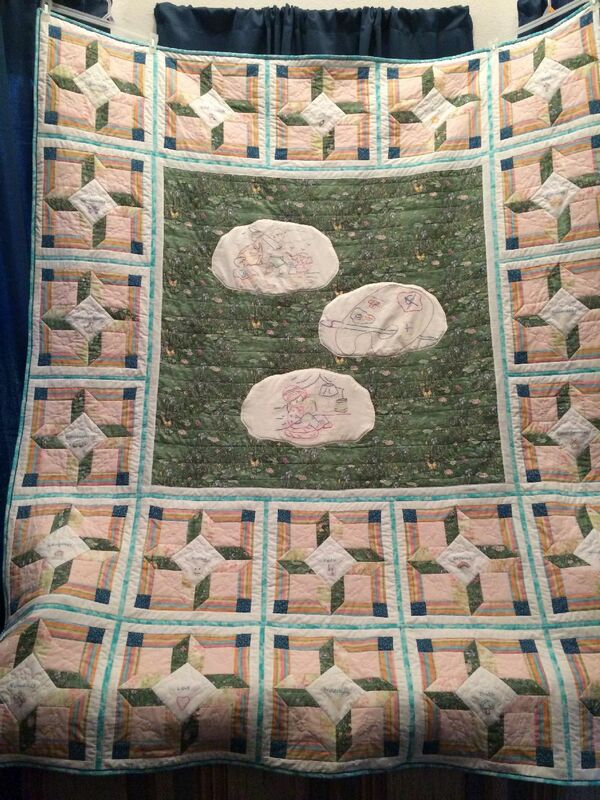 Just look at these adorable placemats Irene finished in March -- perfect for Easter! 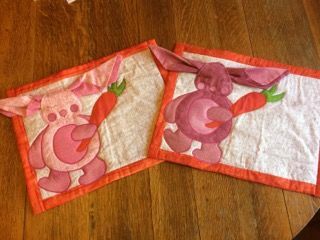 She tells me her grandchildren always use cloth napkins at home, and the ears on these bunnies are really napkins. Too cute! 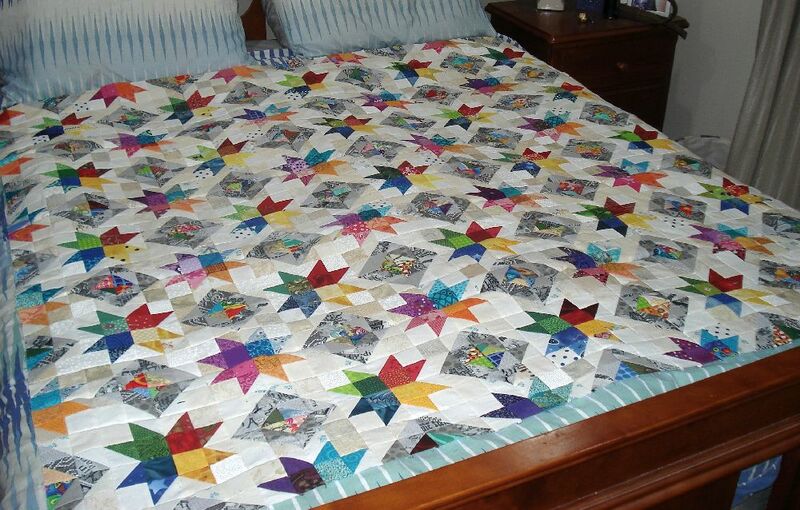 Sandi burned the midnight oil to finish this beauty from Pat Spaeth. 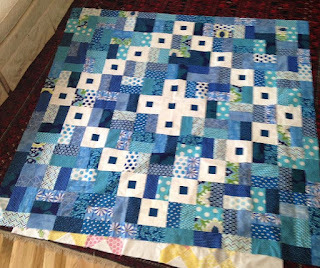 It's made from 5" squares, and is called "Five Inch is a Cinch," from Pat's collection called "Chesapeake." Sandi calls it "Kalvert Kliffs," after a location in Maryland (Calvert Cliffs) off the Chesapeake Bay. 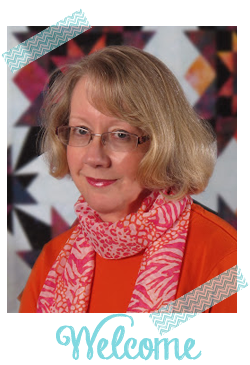 Check out her blog at KwiltnKats. I hope so, too, Jennifer! Another great bunch of finishes this month. Sending Jennifer some positive vibes for a better month in April. Well done everyone! and so true about your "job is interfering with my blogging!"